Be sure that you are using JMRI version 4.5.6 or later to have the correct decoder files. 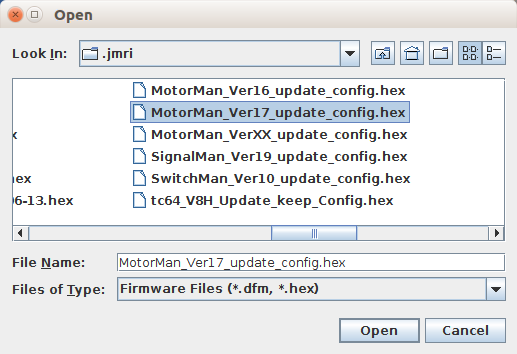 Right click to download the latest MotorMan firmware files from MotorMan_Ver17_update_config.hex We suggest saving the file to your JMRI 'User Files Location' to make it easy to locate. 1. First Disconnect any power from the two position side connector. 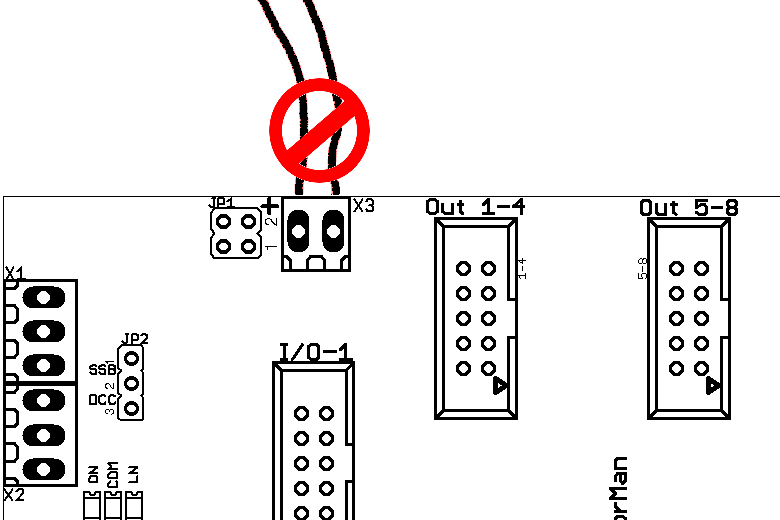 The MotorMan board has a hardware design flaw that allows any failure to initialize the board properly to actually do physical damage to the hardware. To prevent this from happening during the upgrade process, it is imperitive that you disconnect the output power supply from the side connector before you power it up into its Firmware upgrade mode. 2. Add the 3-4 jumper. 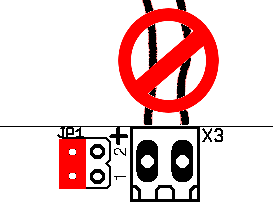 Once the auxilary power has been disconnected from the MotorMan, then add the 3-4 jumper to JP1. 3. Power up the SSB. The Yellow LED should light steadily. The Yellow LED should remain on steadily. 5. 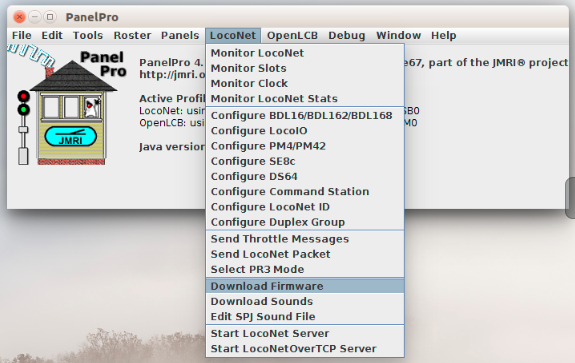 Start LocoNet Download Firmware. 6. 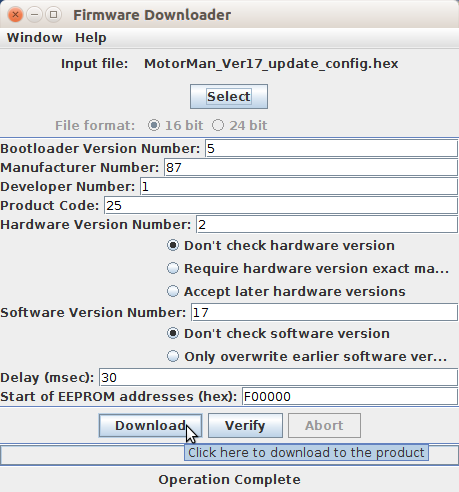 Load MotorMan_Ver17_update_config.hex into Downloader. 7. Start the download process. The yellow LED should flicker faintly until the process has completed. When the upgrade completes the Yellow LED should extinguish and the board should automatically restart. 1 blink: manufacturer code or product code mismatch; - Be sure that you have chosen the proper file to upload. 2 blinks: hardware version mismatch; - You may need to select “Accept later hardware versions”. 3 blinks: hex file software version equal or lower; - You may need to select “Don't check software version”. 4 blinks: unused (no LocoNet® data). 5 blinks: internal programming error detected. - The operation has failed, see below. Each of the above errors will halt the boot loader process. (not the JMRI download program) To recover from these error types, remove power from the MotorMan, add the jumper at JP1 3-4, apply power again, then remove the jumper as before. Correct the error, and then re-run the JMRI program. To recover from the last error type, it must be assumed that the firmware is in an undefined state, most probably damaged or incomplete. If the process is interrupted for any reason you will also end up with corrupted firmware which must be reloaded. The boot loader code itself is protected against being written over. Note that this firmware upgrade will erase all the configuration information. Be sure that you have saved them to roster entries. When completed restore each board by first changing them back to their proper addresses, then power cycling. Next open them again using their proper files, open the CVs tab, and do a Write Full Sheet. That will dump all the saved roster data back into the boards.